Digital tools innovate design methods. The undergraduate workshop ‘Digital Chain’ led by Prof. Li Biao and Hao Hua made the techniques of computer programming, computational geometry, and CNC fabrication accessible to the students. The workshop pursues a seamless digital chain covering form-finding, material research, tectonic design, and NC production. The essential course of design lies in the process of problem-solving with computational methods. During the eight-week workshop, the twelve students developed compelling architectural concepts, built complex scale models and engineered novel fabrication processes. Processing (Java) was employed as the major tool. Programming, algorithms, and computational models are introduced to the students in the first four weeks. In the following weeks each group explored material characteristics, machine capacities and design logics for their pavilion designs. Through this intensive workshop they learned to transform their designs into computer logics and to translate them into material, constructive processes. The project combines Voronoi tessellation and Catenary models, which facilitate structural optimization and surface subdivision. The programed model (in Processing) specifies the shape of dome, the openings and the geometry of cells parametrically. A unique folding method transforms the thin panels into stable 3-dimensional cells. The elaborated tectonics makes the construction process precise and efficient. The project develops a non–orthogonal system of furniture. 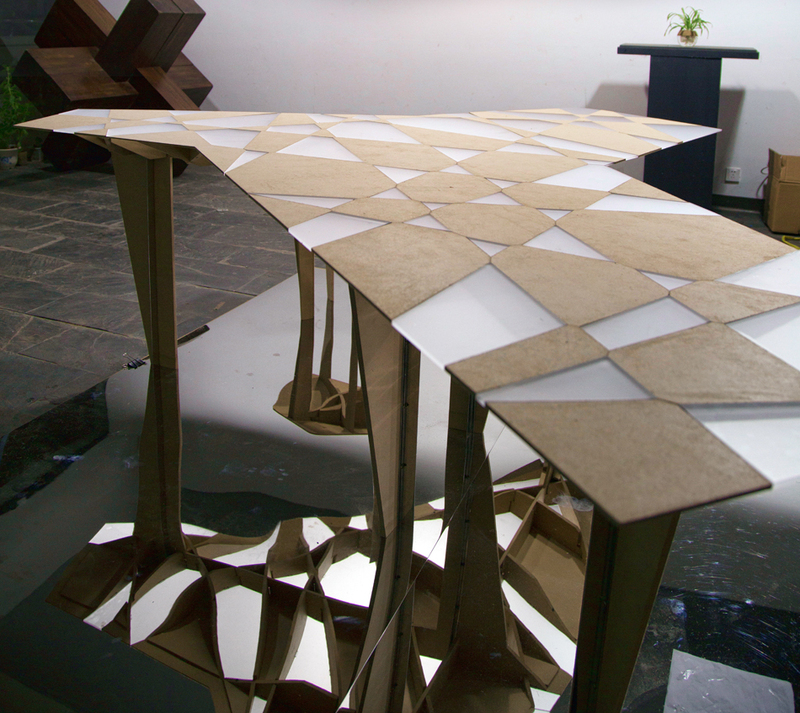 The team explores the algorithmic logics to generate the tessellations of the table surface, concerning the structural stability, the size of panels, and constraints in assembly. 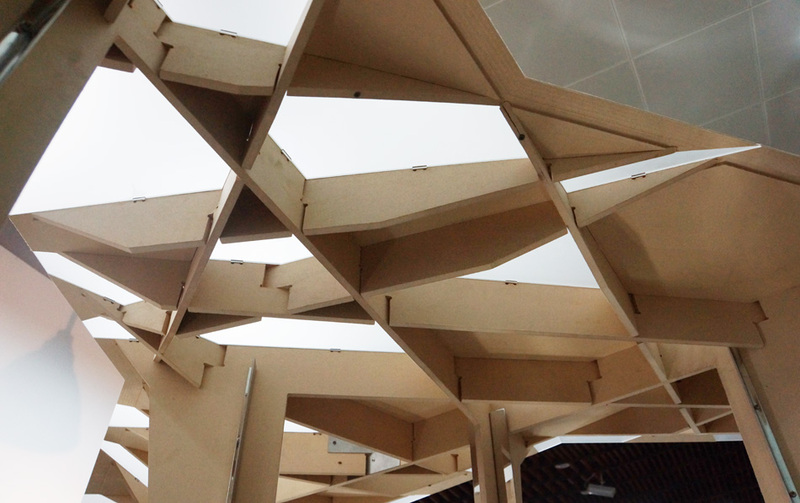 The irregular structural framework is made by fiberboard cut by CNC router. The mixture of acrylic planes and the fiberboard panels on the table surface reveals the logic of the form-finding process. 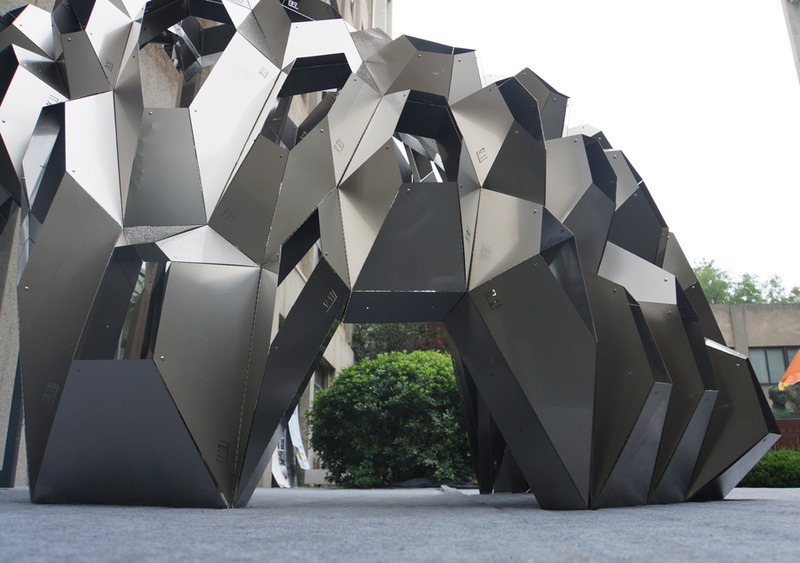 The fully programed fabrication process is applicable for other furniture as wells as pavilions. CUBER investigates the structural capacity of light-weighted PVC panels. 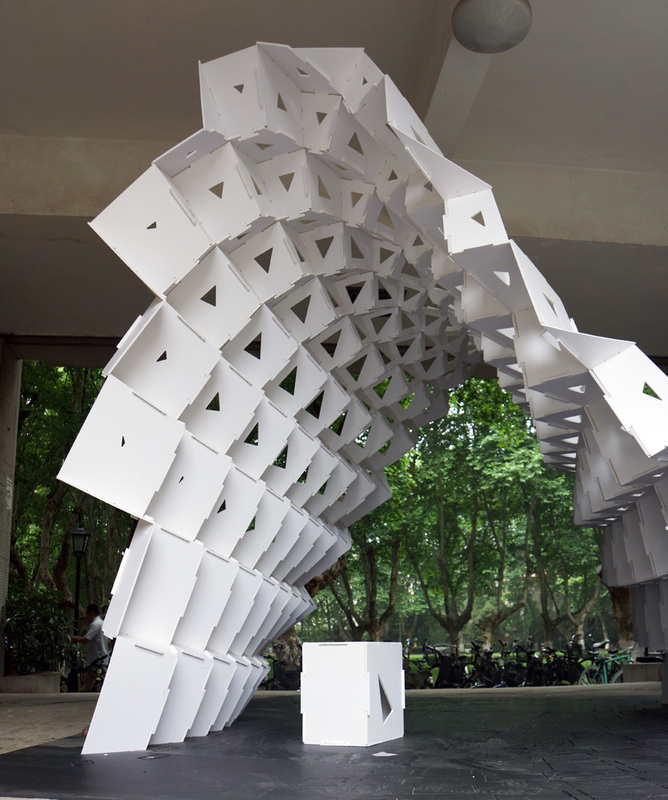 The folding tectonics adds a 3-dimensional structure into the thin surface, which stabilizes the entire structure. The connections between the panels are designed to embed the geometric relationships between the touching panels. Thus the assembly process results in the pre-programed form. The form as well as the openings on panels are regulated to fit the settings of the site. TREE-ANGLE explores the forms of compression-only structure. The triangulation of the surface is integrated with a unique folding-interlocking strategy. 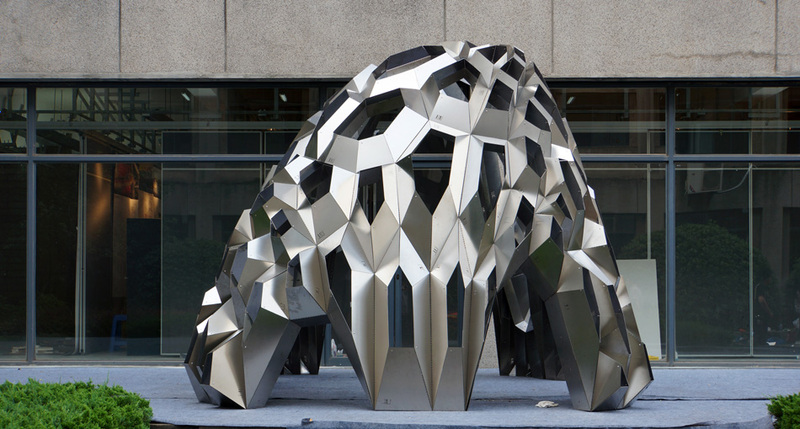 The material, thin stainless steel sheets, facilitates the folding process and simultaneously contributes to the structural stability via the folding-interlocking tectonics. 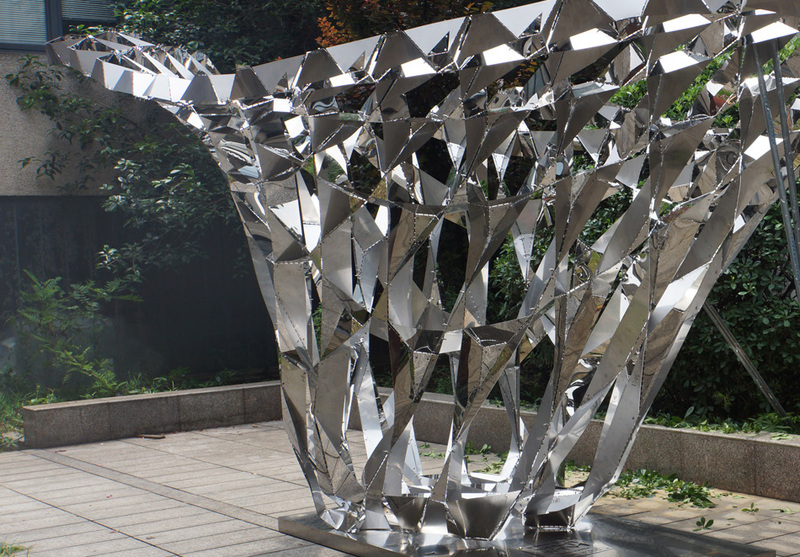 The computer program generates the shape of the pavilion, the geometry of all units, and the machine data, which make up a seamless digital chain. July 12, 2015 | Filed under Others.